Chromatography is used to separate different colored substances in a mixture in order to determine its composition. - The chromatography paper can be simply realized with a retangle of filter paper. - A line must be drawn at about 1 cm from the bottom (using a pencil because ink can contain dyes that could disrupt chromatography): it is the origin line. - A drop of mint syrup is deposited with a pipette on the origin line. - This can be a simple beaker. - Some water is poured ( about one centimeter ). 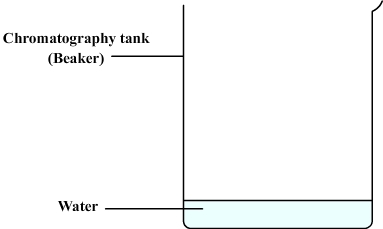 The chromatography paper must be suspended in the tank and must soak in water without wetting the origin line. Through capillary action, the water is sucked through the filter paper and rises (such as coffee that rises in a sugar). The rising water brings with it the drop of mint syrup from which are separated a yellow dye and a blue dye. This experiment shows that the green dye from mint syrup is actually a mixture of two colors: a yellow dye and blue dye. The water that rises in the chromatography paper brings with it a blue and a yellow dyes, but yellow dye moves slowlier than blue, they therefore separate and form two distinct spots.